"A religious zealot offered $250,000 to anyone who would kill me. My two babies were threatened with death. I was condemned by the president, the majority leaders of the House and Senate, the governor of Florida, the pope, and the right-wing media, all because I was doing what Terri—the woman I loved—wanted." "I didn’t respond to their attacks. I didn’t confront their lies. Until now…"
"…You may know the headlines about what came to be known as The Schiavo Case, but that doesn’t mean you know what really happened. And you certainly don’t know why. Frankly, that’s because my efforts while Terri was alive were concentrated on giving her the best care possible, and waging the legal battle to ensure that the promise I’d made to her—that she wouldn’t be kept alive artificially—would be kept. I didn’t have time for public relations. I didn’t have time to expose the hidden agendas of all sorts of people, most of whom wouldn’t have known who Terri was if they passed her on the street. That’s why I wrote this book, and why it’s called Terri: The Truth." Michael Schiavo’s epic battle, first to heal his wife, and then to allow her to die with dignity, was front-page news around the world. To care for Terri, Michael became an EMT, then a registered respiratory therapist, and finally, a registered nurse. Michael has founded TerriPac.org to mobilize voters against candidates who have no qualms about interfering in what should be personal, family decisions. TerriPac will also work to encourage everyone over the age of seventeen to have a living will. Michael lives with his wife Jodi, and their two children, Olivia and Nicholas, in Clearwater, Florida. Michael Hirsh is a Peabody Award-winning documentarian and the author of four nonfiction books, including None Braver: U.S. Air Force Pararescuemen in the War on Terrorism. 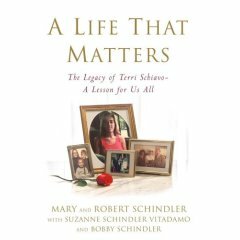 Mary & Robert Schindler, et al., "A Life That Matters : The Legacy of Terri Schiavo -- A Lesson for Us All," Warner Books, (2006). Read reviews or order this book safely from Amazon.com online book store. "In 2004-5, when the Terri Schiavo case divided the country, one side of the story was buried under the avalanche of politics and power. Now, Terri Schiavo’s parents, brother, and sister speak out—for Terri and themselves. A LIFE THAT MATTERS may well change every assumption you have about Terri’s too-brief life and prolonged, agonizing death." "Here the people who loved her and knew her best tell the story not only of the fifteen years Terri struggled to stay alive, but of a gentle child who brought happiness to everyone she touched. This is the story of a normal adolescent who blossomed into the beautiful young woman who captured Michael Schiavo’s heart. And it is the inside story of their troubled relationship, for the members of Terri’s family were witnesses to a growing tension—and were her confidants as she struggled in her marriage with the husband who would later crusade for her premature and unnecessary death." "A book that stakes clear moral ground without a political aim, A LIFE THAT MATTERS takes us inside Terri’s family when the courts ordered her feeding tube removed, and it leads inexorably to a scene that will haunt readers forever: a bereft family barred by the police from their daughter’s hospice room in the final moments of her life." "A LIFE THAT MATTERS separates lies from truth, myth from facts, and politics from people. It challenges us to hear the words and feel the emotions of the warm, intensely private family who never sought the media storm that accosted them, or the devastating legal battle that broke their hearts. The book asks us what we would do if we found ourselves, as the Schindlers did, wanting nothing more than to love and care for a daughter as long as she could live." 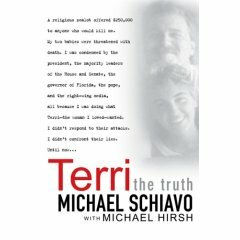 If you see an Amazon.com ad above that is unrelated to the Terri Schiavo case, please click on your browser's refresh key a few times.